I ordered my first robot last week, a Roomba vacuum cleaner robot - my only "black Friday" purchase, prompted by an email offering the little device for $139. At that price I figured it was worth a try (I opted for the cheap but slow free shipping, so it hasn't arrived yet). Welcome to the future, dust bunnies! While we are still a long way from Spielberg's A.I. robots, there are some cool developments in the lab. This article in MIT Technology Review discusses a "robo helper" prototype called STAIR (pictured) at Stanford University that can navigate around the office, understand some spoken commands, and recognize and grasp objects, even figuring out how to grasp unfamiliar objects. The video clip where a researcher says "STAIR, please fetch the stapler from the lab" is pretty amazing, though only the command and delivery parts of the clip are in real time (apparently it takes STAIR quite some time to figure out what to do). I also like this clip (streaming WMV, 15 MB) of STAIR unloading a dishwasher. This clip runs at 2x including the sound, so the researchers' comments sound like the Chipmunks or maybe something out of a Star Wars. Will Wright is a well-known designer of software toys, from SimCity to the Sims. His new game has been in development for a few years and is planned for release in spring 2008. It's called Spore, and it looks amazing. Basically it simulates just about everything, from single celled life to space faring civilizations, with a tremendous amount of player control through editors, time acceleration, interaction with other players' creation via the web, and who knows what else, all within a dynamic universe that includes evolution, physics, societies, and more. The learning opportunities are pretty obvious, but as always with Wright's creations, the play's the thing. Wright gave a very cool talk and demo on Spore at the TED conference earlier this year, and I just learned about the video of his presentation. So here it is. 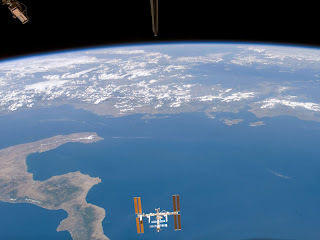 The NASA Astronomy Picture of the Day today shows the International Space Station over the Ionian Sea, photographed by the STS-118 shuttle crew in August 2007 after they had undocked from the ISS. Using a shuttle fleet undocking scenario for STS-118 and with some help from Orbiter's scenario editor, I quickly set up a similar situation and captured a shot of Endeavour positioned to take the space station's picture as shown in today's APOD. The time of day was probably not the same (judging from water color) and you can tell that Orbiter doesn't simulate seasonal terrain changes (southern Italy in mid-August is apparently quite dry, while Orbiter shows a lot of green). But I think it's still pretty cool that you can do this. I've always liked the movie October Sky, which was inspired by Homer Hickam's book Rocket Boys, and this weekend I finally got around to reading the book. Hickam grew up in the tiny mining town of Coalwood, West Virginia in the 1950's, and when Sputnik was launched in October 1957, "Sonny" Hickam got the idea to build and launch his own rockets. This was a pretty unusual thing to do in a poor coal mining town, and of course there were many obstacles to overcome along the way. But Sonny put a team together and over 3 years, they built and launched a lot of rockets. It makes for a great story, much better than the movie in many ways, though the inspiration and support of Homer's mother and of his teacher Miss Riley figure prominently in both versions. Homer's high school dream was to someday work for Wernher von Braun, and when his mother presented him with an autographed picture and a personal note from von Braun on Christmas day 1958 (she had secretly written to him about her son's rocket projects), it brought a tear to my eye. Von Braun's encouraging message ended with the words "if you work hard enough, you will do anything you want." Of course that turned out to be the case, and after some time in the military (including a tour in Vietnam), Hickam became an engineer and worked for many years for NASA, though he never actually met von Braun (as I believe he finally does in the movie version). One scene in the book left me a little skeptical when I read it. In early 1960, John F. Kennedy was campaigning in West Virginia for the Democratic presidential nomination. While shopping for a suit to wear to the national science fair conference, young Homer happened to attend a JFK campaign speech. At the end of the speech, JFK asked for questions, and Sonny raised his hand and asked "What do you think the U.S. ought to do in space?" JFK turned the question around, and Sonny said "I think we should go to the Moon." JFK responded that this sounded like a good idea, and if he were elected president, maybe we would go to the Moon! Did this really happen? Could young Homer Hickam have given JFK the idea for the Apollo program? I'm sure this was suggested by more than one person, but according to the FAQ on Hickam's web site, he did indeed have this exchange with JFK in early 1960! So much music, so little time. As usual the new Paste Magazine sampler CD (#37) has some cool stuff I would never have heard otherwise. One of these is a song called "I Love You, You Imbecile" by Swedish indie/pop artist Pelle Carlberg. I liked the song so I found the video on YouTube and wondered who the girl was singing with him on the song. It turns out she's a Norwegian rocker named Ida Maria, with a voice that reminds me of Björk (from Iceland), except that unlike most of Björk, I really like Ida Maria's songs. She doesn't have anything released yet, but you can hear four of her free-spirited and punky/poppy songs streaming on her MySpace page. Not all the cool music is really new or from Europe. I bought the new James Taylor CD/DVD "One Man Band" which is yet another greatest hits-type collection, but performed live in a small theater in Pittsfield, Mass. with just JT's guitar and a piano player - essentially solo acoustic performances, and with a lot of spoken background "show and tell" about the songs on the two hour DVD. JT was one of my biggest influences (along with Paul Simon and the Beatles) when I started writing and singing songs in 1970, so hearing his songs in this simple setting is really great. It reminds me of when I was learning to play "Fire & Rain" and trying to write something as simple and good as that myself. I was discussing Orbiter with a couple of people at a Thanksgiving gathering last night, and I realized I hadn't written anything about Orbiter for a while. Maybe it's time to begin at the beginning and offer some advice on getting started with Orbiter. 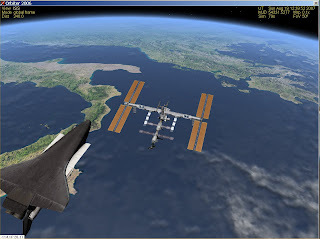 In case you stumbled in on a random Google search or something, Orbiter is a free space flight simulator for Windows PC's. In Orbiter, you're a virtual astronaut operating various spacecraft under physically realistic space and atmospheric conditions - all simulated, of course. Although it's a simulation rather than a game, it's really fun (though challenging) to learn to achieve orbit, dock with space station, and land on the Moon, among the many missions you can fly. How to get started? This assumes you have a Windows-based PC. Orbiter supports optional joystick controls, but most things can be done just as well with your keyboard and numeric keypad (which controls your thrusters and rocket engines). 1. Download Orbiter from one of the listed sites. The main zip file is pretty big, and there are some options like higher resolution textures (better looking planets and moons) in separate files, all explained here. 2. Use an unzipping program to extract the files and "install" Orbiter into a directory somewhere on your hard drive. There really isn't an installation procedure like most Windows programs, but when you unzip, you must make sure that "use folders" or similar is checked so the many Orbiter files will go into the correct directories or folders. 3. Run Orbiter (orbiter.exe in the installation folder) and look at the Video tab of the "Orbiter Launchpad" window. Set the screen resolution to match your PC's display, or to run in a window smaller than your full screen if you prefer (bigger is better). 4. Choose and run a scenario from the Scenario tab - a good one to try first is "Smack! Rescue" in the Tutorials folder. This is actually a flight recorder playback with on-screen notes, so you can just watch to get an idea of what Orbiter is like (there's no sound yet, that's normal). Use the right mouse button to spin the view around if you like. Press F4 to display the main menu. 5. If Orbiter seems to run OK on this test, exit or quit (click Exit on the menu, or Control-Q). 6. Download Orbiter Sound 3.5 from here and install it. This will add sound and music support to Orbiter - an essential free add-on (everything for Orbiter is free). Make sure Orbiter Sound is in the Active Modules list on the Modules tab of Orbiter Launchpad. 7. 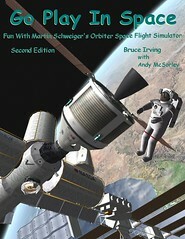 Download my free e-book (PDF) Go Play In Space and print out chapters 1, 2, and 3. These will take you through some background information and basic spacecraft operations. 8. Try other scenarios and just explore whatever interests you. Don't worry if some things seem pretty hard at first - there's a lot to learn, but you can do it if you have the interest. You can also visit Orbit Hangar to look over some of the many available free add-ons for Orbiter, but it's best to start with the standard Deltaglider spacecraft and practice scenarios and tutorial playbacks until you get a feel for the basic operations. The Orbiter Forum is also a good place to visit to learn and to ask questions, but it's best to spend some time with Orbiter and Go Play In Space before you start to ask "how do I get to orbit?" in the forum. Hint: Fly east (90 degree heading), gain altitude to get above the thickest part of the atmosphere, and gain speed to achieve orbit. This is not easy at first, especially on Earth. It's easier to achieve orbit on the Moon or Mars so practice somewhere else first (this is the great thing about a simulator). Orbiter gives you lots of scenarios so you don't have to start at Cape Canaveral unless you want to! Notes: There are two different versions of the space shuttle for Orbiter. 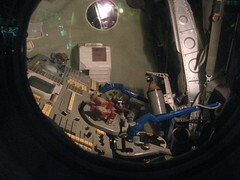 The included one (Atlantis only) is great, but it has no built-in launch autopilot. The add-on shuttle fleet has more features including a launch autopilot, but it must be installed and is more complex to learn. Note also that planet and moon surfaces in Orbiter are smooth textures, "painted on," and not 3D, though they look 3D from a distance. You can get 3D terrain for some areas of the Moon, Mars, and Earth as add-ons, but by default, surfaces are smooth and not too detailed when you are on or near the surface (except at the few surface bases that are provided, such as Cape Canaveral). This is because Orbiter is mainly a space flight simulator, not a ground or low-flight simulator. Now this is a curious development - Amazon has announced the Kindle, a kind of portable e-book reader that is also a wireless-enabled delivery service with an on-line store to get new reading material anywhere you have a cell phone signal (download a book in less than a minute). 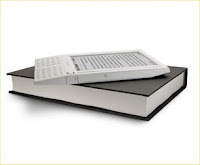 The 10 ounce paperback-book-size device uses a gray-scale "electronic paper" display that is said to be as easy to read as actual paper. The $399 price seems a bit steep, but the wireless service is included (no monthly fees), and the costs of magazine and newspaper subscriptions and books seem to be pretty low (typically $9.99 for new best sellers, less for many older books, much more for technical books). It really does seem like an "eyePod" for text-based materials, and I'm certainly intrigued. But I will wait a while and see what some real customers and independent reviewers have to say. Best-selling authors who tested it out for Amazon seem to like it, as do a few reviewers who claim to have really tested it. There are also many one-star reviews from people reacting to their expectations (no color screen, no PDF support, etc.) without having seen or used the actual product. Very curious indeed! I finished reading The Spirit of St. Louis by Charles Lindbergh yesterday, appropriately enough as I was flying across the North Atlantic on the way home from Frankfurt (it would have been even more appropriate on the flight over to Paris, but I got sidetracked by a couple of SF books). Though the book was written more than 25 years after the 1927 event, Lindbergh's hour by hour description of his 33.5 hour solo flight from Long Island, New York to Le Bourget airport in Paris is incredibly detailed and immediate sounding. He also describes the efforts required to turn the idea of a solo flight from New York to Paris into reality, from organizing backers to help him fund the venture (total budget: $15,000), to the design and construction of the Spirit of St. Louis itself (it took less than 60 days from placing the $10,850 order to delivery of the airplane, and the first flight in San Diego in April 1927 was just a month before the actual NY-Paris flight). Lindbergh also talks about his early life and his often hair-raising earlier aviation experiences. It's one of those books where you keep turning the pages, wanting to know what happens next, despite the fact that you know the ending. Whatever you may think about Lindbergh's later actions and political views, this 1954 Pulitzer Prize winning book is a great accomplishment and a wonderful read. Check out the twenty-ninth Carnival of Space, hosted this week by Riding with Robots on the High Frontier. I've also used the picture that is included with that post because it is just so damn cool. 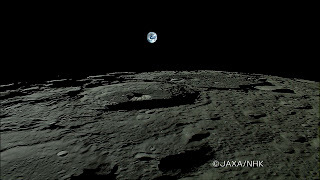 It's a frame from a HDTV video taken by Japan's Kaguya spacecraft. Several carnival posts this week talk about these amazing images from lunar orbit. You can also learn more and see some zoomed-in Earth images and a nice Earth-set sequence in this JAXA press release. After a few hours drive from Barcelona in high winds and surprisingly cold weather (4°C), I'm spending the night and a little time in the morning in the center of Arles, a city rich in history dating back to the Greeks and the Romans - even before my time. 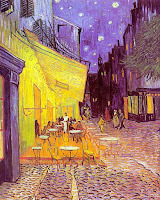 All I knew about Arles before arriving here was that Vincent Van Gogh lived and painted here for some time. My hotel room even has a print of one of his famous paintings, The Cafe Terrace on the Place du Forum from 1888. We walked past this spot on the way back from dinner, but it was so cold and windy (and late) that no one else was around. I hope we have some time to walk around in the daylight tomorrow before a 10 am customer visit in Aix-en-Provence. Yes, this is a pretty rough business trip! Spain was nice but it's good to be back in France where I like the food better and can speak and read two of the most common languages (English and French), which means I have a chance of knowing what I am ordering! Astronomy Magazine Award for Aldrich! Astronomy Magazine has announced the winner of its 2007 "Out-of-this-world" award, and it's the Aldrich Astronomy Society, the central Massachusetts astronomy club of which I am a member. The $2500 prize will be used to buy astronomical equipment and materials to expand our outreach activities. The press release also mentions that Aldrich has the unique distinction that four of its members are NASA/JPL Solar System Ambassadors (I'm one of them). I think I've written before about my habit of trying to tie my reading to my travel whenever possible, like when I read Shirer's Rise and Fall of the Third Reich on a 1992 visit to Berlin, or major parts of The Jewish War by Flavius Josephus on an Israel trip when I visited Masada. But it's not all about war history - one reason for wanting to visit Le Bourget is because I'm carrying The Spirit of St. Louis by Charles Lindbergh, said to be one of the greatest flying and true adventure books ever written which I somehow have never read. Le Bourget is where "Lucky Lindy" landed after he flew solo across the Atlantic in 1927. I may still get to it on this trip, but airport bookstore mania struck again and I ended up buying and quickly reading Old Man's War by John Scalzi, a great SF (first!) novel. My flight from Washington to Paris was delayed 5 hours, so I actually finished that book, found a Borders at Dulles, bought the sequel The Ghost Brigades, and have almost finished that one too (I'm a pretty speedy reader). Fast paced and really good reads, both of them. I'm staying tonight in a hotel near Charles de Gaulle airport in Paris, the start of a week of business visits around France and Spain. It was raining this afternoon, but I decided to pay a quick visit to the Musée de l’Air et de l’Espace (web site seems to be in French only, but here's a brief English description), the French air and space museum at Le Bourget airport. I've been to the museum before and also attended the Paris Air Show at Le Bourget a few years ago, but this time I mainly wanted to revisit the space exhibits in light of my recent space flight simulation and astronomy obsessions, and to get a close look at the full-scale mockup of the Ariane 5 launcher that I have launched many times in Orbiter simulations. It's big, and today it was wet, as was I.
I have to say that the aircraft collections (especially WWI) are a lot better. The space stuff is nicely presented, but it's not exactly exciting or up to date. Most of the spacecraft on display are mock-ups of Soviet-era Russian spacecraft, mostly from the 1960's, though there are some good exhibits on the Ariane launchers, including a full-size payload shroud with a mock-up of the SPOT 1 Earth monitoring satellite. While some of the Russian spacecraft mock-ups are cool looking or have interesting histories, the only real hardware I found was the Soyuz T6 reentry capsule. This was used in 1982 to return two Soviet and one French cosmonaut to Earth after a 2-week mission to the early Salyut 7 space station. It is really ridiculously small inside, especially for three people. When I first visited years ago, the actual Apollo 13 command module Odyssey was also here, but now it is on permanent display at the Kansas Cosmosphere and Space Center (which looks like an amazing space collection for a future trip). More pix on Flickr. 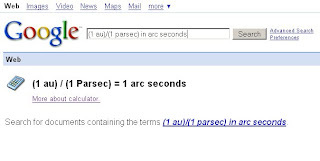 A colleague pointed out that Google has a very interesting "free form" calculator capability built into its search engine. While it can do obvious things like 33+sqrt(15), the really cool thing is its support for units and dimensions, allowing you to mix and match lbf (pounds-force) and newtons, even feet, meters, parsecs, and furlongs. It also knows many constants like c (speed of light), G (the gravitational constant), and g (acceleration of gravity for Earth), so you can enter things like g-G*(5.9742E24 kg)/(3959 miles)^2 in m/s^2 which compares the stored value of g to a calculated value from the Earth's mass (kg) and radius (in miles just to show the use of mixed units). Or how about (5.9742E24 kg)* c^2 in BTU, applying Einstein's most famous equation to find that 5.09 x 10^38 BTU's would be released if the Earth's mass were completely converted to energy, perhaps in a collision with an anti-Earth. Complete instructions are here (for the calculator, not for converting the Earth's mass to energy). I wish there were a list of the supported units and constants - I tried various combinations for energy in kilowatt-hours until I found that kWh works (that's 1.49 x 10^35 kWh for you Earth annihilators who prefer electric bill units). Update: I should have done a Google search on Google calculator units! I just did, and this article has all the details on supported units and physical constants. It also reveals that I could have inserted planetary masses and radii directly by using m_earth, m_sun, r_mars, etc., so my formulas above could be g-G*(m_earth)/(r_earth)^2 in m/s^2 and m_earth*c^2 in kWh. 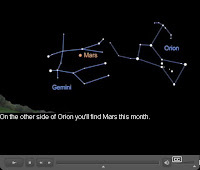 Every month, JPL posts a short video of night sky observation highlights. "What's Up for November" talks about Mars and the variable star Mira. The video is available in streaming form (Flash player) as well as in HD, MP4, and video podcast downloadable formats. While NASA on the whole offers a wide range of educational outreach materials, JPL is especially strong in this, with a growing range of video and other multimedia materials. Carnival of Space #28 is now up, hosted this week by Emily Lakdawalla at the Planetary Society Weblog. Comet Holmes and the planets of 55 Cancri are the hot topics from multiple bloggers (including me), but there are plenty of other fascinating posts to explore on a variety of space and astronomy topics. Emily does a nice job on this carnival, as she does in all of her writing, which in keeping with the goals of the Planetary Society, delves deeply into planetary science and exploration, mostly in our solar system, but sometimes in others. The Planetary Society was founded in 1980 by Carl Sagan, Bruce Murray, and Louis Friedman to encourage the exploration of our solar system and the search for extraterrestrial life. Its activities are well worth supporting and I am proud to be a member. 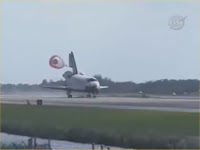 Discovery just landed on runway 33 at KSC to complete the truly amazing STS-120 mission. As Discovery was passing over Vancouver,BC on the final entry path that took it southeast over the whole United States in under 30 minutes, Houston told Commander Pam Melroy to expect poor communications for a while, "ratty coms from Mach 22 all the way down to Mach 10." All the way down to Mach 10!?! I don't know why that struck me as funny - something like "when you get from being a space ship down to a relatively pokey ten-times-the-speed-of-sound glider, we'll be in touch." We've been flying people in space for forty-some years, but this is still really, really incredible stuff. Even the routine things, like slowing down to Mach 10. Back in February I wrote about a fairly decent SF novel I was reading, Coyote by Allen Steele (it had some problems, but I liked it well enough to read the sequel, Coyote Rising). Coyote is a "novel of interstellar exploration" that starts in 2070 and involves hundreds of colonists traveling for 230 years (in "biostasis") at 20% the speed of light to reach a star system 46 light years from Earth. There they wake up and land on the fourth moon of a Saturn-like gas giant planet orbiting in the habitable zone of its star. This Earth-like moon was named "Coyote." Today NASA announced the discovery of a fifth planet orbiting the star 55 Cancri, 41 light years from here in the constellation Cancer (more info including a cool video here). It is a remarkable achievement of observation, data collection, Doppler-shift measurement, and data reduction to tease out the properties of the star's five individual planets from 18 years of observational data from California's Lick Observatory. What's even cooler is that while the fifth planet (which is actually the fourth in distance from its star) is also a gas giant (45 times the mass of Earth), its orbital distance (116.7 million kilometers, orbital period 260 days) puts it within the habitable zone of its star (closer to the star than we are to the sun, but the star is fainter than the sun). That means that if it has any rocky moons orbiting it, they could have liquid water on their surfaces, and where there's liquid water, there could be... you get the idea. Of course no moons have been detected yet, but all the gas giants of our solar system have them, and it's reasonable to assume that extra solar gas giants would as well. So "Coyote" could be there, and it's 5 light years closer than in Steele's novel! Now we need to get to work on giant space-based optics so we can image those exoplanetary moons, not to mention the star ship and propulsion systems that will give us 0.2c, and the robotics and biostatasis system that will let our intrepid colonists sleep for 200 or so years on the way to their new home. This is left as an exercise for the reader. Update: For anyone interested in more details and serious discussion, this post in Centauri Dreams is a good place to start. The comments have additional details including a link to a PDF preprint of the five-planet paper by the scientific team. As Paul notes, we are indeed entering what seems to be a golden age of exoplanet research. Tomorrow (Monday 11/5) morning between 5:52 and 5:58 am, the ISS and the undocked Discovery will make a nice, high-elevation pass from the southwest to the southeast at my location. With sunrise at 6:25 am, it should still be dark enough to see them, and the Moon and a few planets will be up at the same time (Mars, Venus, Mercury, Saturn). Unfortunately the forecast is for mostly cloudy, but I'll still get up early and hope for a break in the clouds. That was how I saw the ISS and STS-118 in August, the night before Endeavour landed. It was an mid-evening pass and there were a few lucky breaks in the clouds (the next evening I saw a very close ISS pass with clear skies). 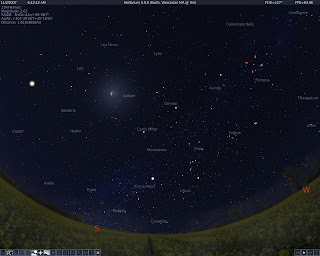 The picture is not from Stellarium, but from "Starry Night Special Orion Edition," a commercial astronomy program that came with my new toy, I mean educational aid, the nicely portable Orion StarBlast "mini-dobs" reflecting telescope (more on that when I get a break in the clouds and can try it out). 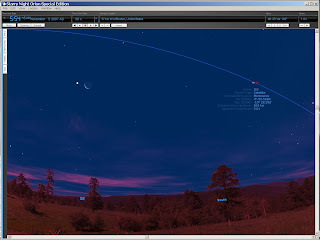 Starry Night is similar to the free Stellarium, but does offer some useful additional features, one of which is a web-based facility for automatically getting updated satellite information and displaying it along with all the usual planetary and star information. That's where this ISS display came from, though I did also check the time with NASA's SkyWatch site. Update: I saw them! The clouds cooperated, opening a huge swath of sky. The ISS was bright and distinctly non-symmetric in shape as it passed just to the south of overhead, 424 km away at its closest point - it looked like it had a small appendage, which may have been Discovery, though it was only about 100 meters from the ISS at the time (I should have grabbed the binoculars). The Moon and Venus were beautiful and I was able to see Mars, Sirius and possibly Saturn. Cool! Thanks to NASA TV, I've been watching the STS-120 EVA that is in progress to repair a tear in one of the solar array panels on the ISS. Astronaut Scott Parazynski is on the end of an extender (OBSS) attached to the space station's robotic arm (SSRMS) to get him close enough to do the repair. With 100 volts or more in play (you can't turn off the sun), he is using insulated tools and a carefully designed procedure to make the repair. It's an amazing team effort with the EVA astronauts, the on-board crew, and the experts in Houston making sure that every step is as safe as possible. Humans are awfully good at this sort of dynamic problem solving. The robotic arms get a big assist (though these too are under skillful human control). I took a couple of screen shots in Orbiter using a shuttle fleet scenario provided by David413 on the Orbiter forums to illustrate the EVA geometry. The one here gives an idea of how big the ISS/shuttle complex is and of how far from the shuttle and ISS living quarters the repair site is - about an hour away from getting back inside, making this space walk a bit more risky than usual (they normally like to no more than 30 minutes from getting an EVA astronaut back inside in case a problem develops). But Dr. Parazynski (originally a physician) is a very experienced EVA astronaut and he's making it look and sound easy, which of course it is not! More pix on Flickr. N.B. 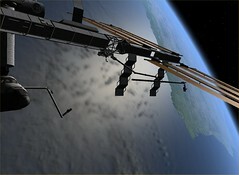 The repair was successful and they were able to fully deploy the solar panel. I was out very early this morning and was treated to a dark and totally clear sky at 6:10 am, though I didn't have much time to enjoy it. Venus was bright and high in the east, the Moon and Mars were almost overhead, Orion was clear and bright, and comet 17P/Holmes was clearly visible (here's a recent telescope shot showing the comet's tail, which is extremely short because the comet is heading almost directly away from us). This Stellarium shot doesn't do it justice but it shows what was up. Just before 8 am I went for a 40 minute walk in the office park woods while listening to an amazing recording of classical guitarist Kazuhito Yamashita performing his arrangement of Mussorgsky's Pictures at an Exhibition. This colorful work is a favorite classical piece of mine in its Ravel-orchestrated version, and it's just crazy the range of tones and rhythmic effects that Yamashita coaxes from a single classical guitar. An incredible tour de force. With the sunlight filtering through the colorful leaves, it was quite a cosmic experience. There is a god, and it is called iPod! 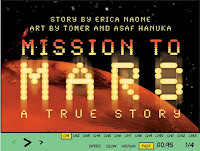 This Flash-based comic book-style story of the ups and downs of NASA's real Mars exploration efforts is pretty cool. Thanks to MIT Technology Review's daily update!